Crafting is rumoured to be a slow, useless and boring skill, but once you get into it there’s lots to do! You can make everything from pots for collecting flour to dragonhide armour for rangers. Crafting can be found all over the RuneScape world: the amulets people wear, the vials used in Herblore and the mystic staves used by magicians in battle. These items are all made by crafting. Please note that items shown shaded in light blue (in tables below) are free to play items. You can get crafting exp from dyeing capes. You can get dyes from Aggie in Draynor Village. Go there and ask her about the colour you need. She will tell you what items are required and her fee. When you have the dye you need, use it on a black cape (get these from killing Highwaymen), or on a red cape which you can get from the clothes shop in Varrock. Members can also go to Ali the dyer in the north-east corner of Pollnivneach, or purchase ready-made dyes from Oronwen in Lletya. Hello, I’m really interested in whats possibly the fastest way to get all skills 99 in IronMan mode. Here’s what I think the best way is to achieve 99 in every skills. Please if you know a better way, let me know so I can change it.I’m not going for max when IronMan comes out, I’m just interested in how differently skilling will be compared to a regular account. You wont want to power-skill those like most people on regular accounts since you need supplies to train other skills. First, getting an axe. You can buy up to steel from Bob at Lumbridge. Personally I wouldn’t get too high in woodcutting until you get at least a rune axe. Rune is easily attainable from steel dragons at mid-combat level or with 86 smithing. If you are high enough level and have the necessary resources, get a dragon from the Dagannoth Kings.Now to actually train it.Woodcutting can benefit fletching, firemaking, construction and summoning.Of course you will be cutting normal logs until you don’t need them anymore for fletching and firemaking and got enough banked to make normal planks for construction. Then jump to oak until you have enough for fletching and firemaking.Now you will need to cut a lot of willow. Enough to get at least 65 fletching and 60 firemaking. I would stay at willow until 70+ woodcutting to have some extra logs to make beaver pouches. These are some of the best pouch to make with green charms from low level to level 88 so i would suggest having a few 1000’s extras. This one is pretty straight-forward. You will need food to train and/or kill bosses so you wont want to drop any fish.First start with doing the quest “Rock Slug” witch will get you from level 1 to over level 20 fishing. Then you can start fishing and cooking trout and salmon, at higher level you can start lobsters. You will then want to fish lobsters until 90 fishing. (Need confirmation, could swordfish+tuna be better xp/h than lobster? )At level 90 fishing you can start to fish rocktails you will need to fish 19k rocktails so you will need to get 19k living minerals. How Do You Deal with Hati & Sköll – The Wolf Pack Returns? Hati and Sköll – the winter wolves of Fremennik legend – are back from Thursday the 16th of January. So, you can bring bonus XP aplenty for defeating them. Maybe, buying cheapest rs 3 gold is the fast way to make success in fighting against them. Welcome to rs3gold where you can get cheap rs 3 gold fast & safe. You can always get cheapest rs 3 gold from this site. At present, the 10% off code can be applied to your order at any time. Needless to say, you will get savings once you’ve finished your payment successfully. The more you buy the more you will get. 10 minutes around delivery is guaranteed on rs3gold and you don’t need to wait rs 3 gold buy for a long time. At the same time, you can be devoted to plating your game without any stops. The fast delivery will make you feel easy in your game. As players of RS, you’d better buy rs 3 gold guaranteed by security services. RS 3 gold for sale on our site is handmade by skilled players and bots or macros are never used to rs 3 gold farming. So, just feel free to buy rs 3 gold cheap for sale here. It is good for your RS account safety when you want to buy supplements with cheap rs 3 gold. 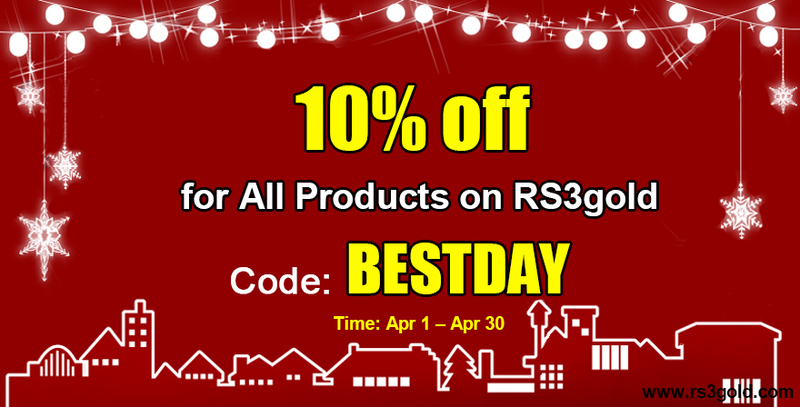 Now, it is time for you to buy rs 3 gold cheap on this best rs 3 gold site where you can enjoy the 10% off benefits for rs 3 gold with the discount code “BESTDAY”. Not only will you get cheapest rs 3gold in price, but also enjoy the fast delivery & safe services. Besides, the 24/7 live chat will offer you help whenever you want. So, do you want to have a try on www.rs3gold.com? Have You Got One of a Runescape Golden Scythe Yet? The golden scythe is an item that was first spotted in the Toy box in Player owned houses when the 2011 Hallowe’en event was released. They were given to the first 25 people who completed the Deathcon II event being held at RuneFest, thus making it one of the rarest items in the game. Have you even seen one? Or even got one? Golden scythe actually is a fun weapon and purely cosmetic, which means it has extremely low stats. It is significantly different compared to the scythe from 2003 to avoid confusion between the two. The Golden scythe cannot be bought from a store for it’s a symbol of honor that the only 25 first players who completed Jagex’s scavenger hunt puzzle at RuneFest 2011 have a chance to receive it. Also, it cannot be traded or alchemised. If you lose your Golden scythe, it can be reclaimed for free either through the toybox in their player-owned house, or by visiting Diango and asking to see his holiday items. Have you ever met or even got one? Just like Mod Mat K ever said that the golden scythe is a reward for the first 25 players at Runefest who hand in the correct answer of the Deathcon II event being held there. It is a fun weapon so has no stats and is significantly different to the scythe from 2003, so there won’t be any confusion there. If you see someone with it, make sure you take a screen as you won’t see them often. A player from www.reddit.com recently sees one of them and was so excited about it. Have you ever seen it? Have you take a screen for it? Or you just strong enough to own one? If you do, share with us! You may need to note that unlike the other RuneFest commemorative items which have a separate reclaimation menu at Diango (which is shared with the vanity items), the Golden scythe is reclaimed via the regular holiday item menu.